Congratulations on your upcoming proposal! Shopping for an engagement ring can be filled with mixed emotions of excitement and feeling overwhelmed. So, before you dive into this fun journey, let’s talk about some of the basics you should consider before looking for her ring. 1) Budget– It is always good to have a budget range in mind. This amount will help you narrow down your search to the rings that you are able to afford. If you are not sure how much you should spend, the traditional rule is 2 – 3 months of your income, although your final budget is really up to you. One of the unique aspects of Bespoke is that we work within your budget as much as possible. 2) Reconnaissance– By now she has probably taken you into jewelry stores to “pretend” shop. 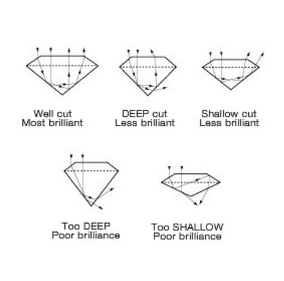 Use that time to find out what type of diamond shape (round, princess, etc.) she likes as well as the type of setting (solitaire, three stone, etc). Use her friends – if you think they can keep a secret- to find out what she has told them. Look in her jewelry box to see if she has more traditional or contemporary tastes. Basically, be observant. 3) Her Involvement– Do you want this to be a total surprise or can she be involved in aspects of creating the ring? Most women like to have some input on what their ring will look like. The most subtle way to still have her be a part of the process without knowing too much is asking her to show you pictures of ring styles that she likes. This will help you determine what rings to concentrate on. A more active role would be for you to show her 3 – 5 different settings and have her select the ones she likes. You can then make the final decision so that she does not know exactly which one you selected. Or, you can let her do all the work and pick out the ring that she wants. No matter what, she is marrying you and not the ring, so she’ll love whatever you create! You know you want to buy an engagement ring, but what style should you choose? Who knew there where so many different types! Hopefully the following will help. 1) Solitaire- The classic engagement ring. The solitaire is one of the best know types of ring as well as one of the most popular due to its simple elegance. Within the solitaire family there are sub-styles that reflect the band or head style, such as cathedral solitaire or trellis solitaire. 2) Three Stone- The name says it all. These settings are made up of three main stones where the center is usually the biggest with two stones that are about half the center stone size on each side. There may be smaller accent stones in the band as well. 3) Halo- Art Deco, anyone? Fashion trends are cyclical; jewelry is no different. The halo engagement ring style hales from the Art Deco period of the 1920 – 30’s where the center stone is surrounded with smaller accent stones. Depending on the setting, these small stones will work as enhancers to the center stone- almost as if they were spotlights. 4) Antique/Vintage- Old school taken to a new level. These settings are rich with engravings and ornamentation and invoke a sense of Victorian era flare. 5) Fancy- Let the glitz begin. 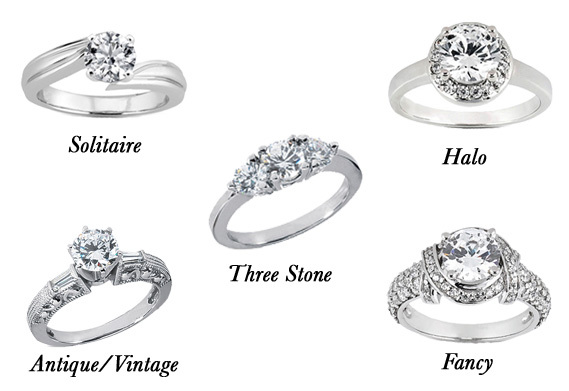 These engagement rings usually have a good size portion of accent stones- sometimes creating intricate designs- around the center or main stones as well as in the band. Some people call these settings fussy or over-the-top others think they are just right. It’s your preference that ultimately matters! Most people would agree that the center diamond is the most important part of an engagement ring. So, what do all those acronyms stand for, and does size matter? Let’s take a look. A diamond has four core determining factors: Cut, Carat, Clarity, and Color. These are what we call the 4 Cs. To learn more about each one of these characteristics go to the “Diamonds- 4 Cs” tab at bottom of page. Here you will learn more about what jewelers mean when we use acronyms like F, SI1, VG, etc. When selecting your center diamond the size of the stone is just one aspect you should consider. Having a huge diamond that is a dull yellow with noticeable dark spots and no sparkle is far less pleasing to the eye than a smaller diamond that is white, clear, and sparkles brilliantly in the light. On that note, the size- or carat weight- of a diamond is the main determinate of price. Because larger diamonds are more rare than smaller ones, the price will increase exponentially as the carat weight increases: for example a 1.0 carat diamond is not simply double the price of a 0.5 carat diamond with the exact same characteristics; it is actually more than double because 0.5 carat diamonds are much more common than 1.0 carat diamonds. When searching for your perfect diamond engagement ring, you will hear mention of the “4 Cs”. A diamond’s quality and value are evaluated on four criteria: cut, color, clarity, and carat. The 4 Cs will help guide you in your search, yet are just a beginning point to finding your desired diamond. Like humans, each diamond is a unique, natural creation. Two diamonds having the same qualities on the 4 Cs scale does not mean that they will actually look the same. A diamond’s brilliance and fire (brightness and sparkle) comes from the way a craftsman cut it from raw carbon to shining beauty. Cut, the only man-influenced factor of the 4 Cs, refers to the stones proportion, symmetry, and polish. Light entering an excellent cut diamond- neither too deep nor too shallow- will reflect off the facets inside the stone and reappear through the top, making the stone radiate from within. Bespoke’s preferred standard cut is very good or excellent. The less color one sees in a diamond the more rare and, therefore, more valuable the stone. Diamonds are measured on a color scale from D, colorless, to Z, noticeable light color. Diamonds that are vivid yellow, blue, or pink are considered Fancy Diamonds, and are also quite sought after due to their rarity. Bespoke’s preferred color standard is D, E, F, G.
Almost every diamond has natural impurities resembling tiny crystals, clouds, or feathers. These features are what make every diamond unique. Most of these “inclusions” can only be viewed under 10x+ magnification. Consequently, diamonds are graded in regards to the size, location, number, and color of the inclusions. decrease in clarity as they increase in impurities. Bespoke’s preferred clarity standard is FL to SI1- nothing visible to the naked eye. The size of a diamond is determined by its carat weight. This weight is usually expressed in points. One carat is equal to a fifth of a gram or 100 points. The larger the stone the more valuable it is due to the less frequent existence in nature. However, two diamonds of the same carat weight might have varying brilliance and fire due to their cut and proportion. Thus, carat weight must be placed in the right combination of cut, color, and clarity to have a truly remarkable diamond. Having your engagement ring setting made out of the right metal is important. The type of metal you choose plays a key role in how easily your ring will scratch or change color. The three main metals used for engagement rings are: gold, platinum, and palladium. Gold jewelry pieces are generally yellow, white or rose in color. In its raw form, gold is yellow and quite soft. So that your ring does not simply flatten the next time you hit it on something, other harder metals are added to it. 14K gold is 58.5% pure gold and 18K gold is 75% pure gold. The other portion is alloys that are added to increase durability and create certain colors- such as copper in the case of rose gold. White gold settings are usually rhodium plated to create their bright white look. If a setting does develop a dull yellow color in areas, it can easily be rhodium plated again at any time at a minimal cost. However, caution should be taken with how often you rhodium plate since fine amount of the gold is taken away during the preparation process. Platinum is an excellent option for your engagement ring and other jewelry items. It is the densest metal used which means it will last the longest and hold your diamond the most securely due to its strength. It is more rare than gold, and when used in jewelry pieces it is 95% pure (compared to 14K gold that is 58.5% pure). This rarity and purity also increase the price to almost twice that of gold. Platinum is naturally white and tarnish resistance. Palladium is a good alternative to white gold. It is naturally bright white (and stays that way!) and is in the platinum family. Even though it is 40% less dense than platinum it still has similar strength and is stronger than white gold. Additionally, like platinum, palladium settings are 95% pure metal. With its strength coming from being in the platinum family and it looking identical to white gold in color*, palladium is the best of both worlds for your engagement ring! *A new, polished white gold rhodium plated ring and a new, polished palladium ring side by side look the exact same.